Galactus, France’s answer to SpaceX, has just launched a communications satellite into orbit, but the payload actually harbors a frightening weapon: a nuclear-triggered electromagnetic pulse. When the satellite is in position, Galactus’s second-in-command, Dr. Nevaeh Patel, will have the power to lay waste to the world with an EMP. A former astronaut, Patel believes she is following the directions of the Numen, aliens who saved her life when she space-walked outside the International Space Station. She is convinced that with the Holy Grail, just discovered by the owner of Galactus—eccentric treasure hunter Jean-Pierre Broussard—she can be reunited with the Numen, change the world’s destiny, and become immortal with them. With their signature “nonstop action with enough realism to keep you thinking and scare the daylights out of you at the same time” (Suspense Magazine), Coulter and Ellison have created a thriller to take you on a breakneck and breathtaking journey. adventure thriller about a race to save the world." 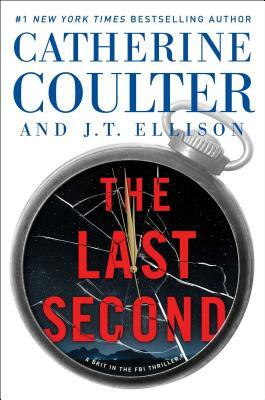 "Coulter and Ellison’s series has locked itself into a wonderful groove.... The Last Second is a perfect example of a popcorn movie in print form, and their latest in this series arguably is the best one to date."